One of my favourite plants in my garden is Nandina pygmaea – Dwarf Sacred Bamboo. It is an evergreen shrub, used for its foliage and will apparantly endure diverse growing conditions. It grows well in a container and can be used as a background plant, low hedge, in a shrub border and as a groundcover. 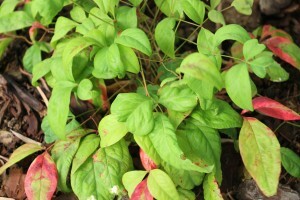 It grows in full sun or partial shade (green leaves) preferring moist, but well-drained soil. This little plant is a dwarf version of the Nandina domestica and is native To China and Japan, where it is often planted near temples. Nandina will endure diverse growing conditions and grows easily throughout the country, but needs regular watering in dry areas. It is hardy to all but severe frost and will grow +-50 to 60cm tall and +-50cm wide. It will grow in full sun or semi-shade, but the leaf colour is more intense in winter if it is planted in full sun. In very arid regions it is best planted in semi-shade. Heavenly bamboo is semi-evergreen and will drop some leaves in winter. It prefers a light, moist well-drained soil, but will grow in most garden soils. Although it is moderately drought hardy, it responds well to regular watering in summer. Yes – I really do love these plants too. They are well suited to your garden and you have them so beautifully placed down the side of your house.